Today I decided to go ahead and do some painting. I started with the roof because I figured that was the best place to get practice so if I messed up it would not be visible. 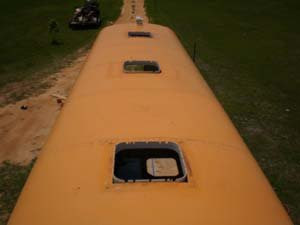 There are 3 pop up vents on the roof of the bus. I had to begin by removing each one. After their removal I had to scrap off all the remaining silicone around each opening. This actually took some time because the silicone was well attached to the metal. 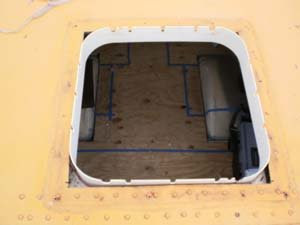 Here is a pic of all the vents removed. The best advice I read on painting preparation, if primer was not going to be used, was to simply wipe down the surface that you are going to be painting with paint thinner. 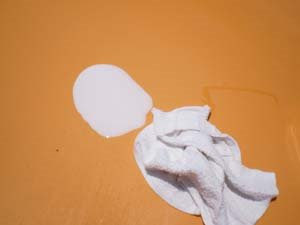 This provides a clean surface for the paint to adhere to. I already had the thinner and the rags so I was ready to go. The thinner I used is called Safer Paint Thinner by Kleen Strip. It is a new product that is out that is more "green" and is less harmful to your skin not to mention good old mother nature. I guess "Safer" means it will take a little longer for me to get cancer then using the standard thinner. This thinner comes out like a milk color and consistency and seems to work good. 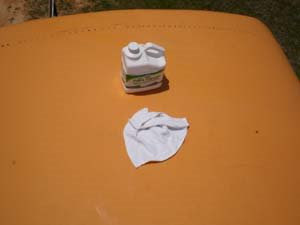 I took a clean cloth and wiped down the bus roof from the back to the front. Lets just say I was ready for a break after wiping down about 280 sq ft of bus roof by hand. Now I was ready for paint. 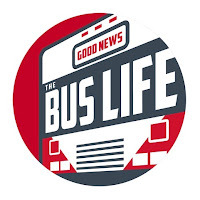 The articles I have read state that Rustoleum is a great paint to use on vehicles if you are wanting to save some money and not go the rout of automotive paint. So for the roof we decided on gloss white. Probably the main reason for this color choice was because white is reflective and the less heat in the bus the better. This color should keep the roof a lot cooler. 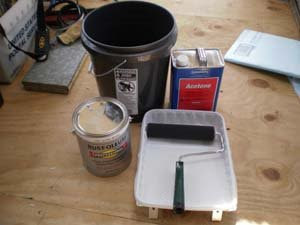 The instructions on the paint can states that if you are going to cut the paint to do it with acetone. So we mixed one gallon of paint with a half gallon of Acetone in the 5 gallon bucket. 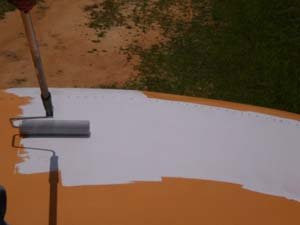 This should give us a good smooth surface if the proper applicator is used. I went to the local lumber yard and picked up 4 foam rollers, a paintbrush, a paint tray and 3 liners. This cost about $38.00. The first problem I noticed was the paint tray liner was a little to small. The edge of the roller was hitting it. We found some other plastic liners that we had sitting around from a previous paint job. They fit better. 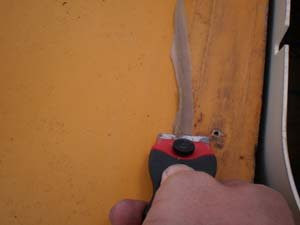 Then as I was painting my roller was falling off the roller tool so again we swapped out the roller tool. Now that I thought nothing else could go wrong, lo and behold my roller started coming apart even though the package states "Will work with ALL paints". I was now feeling good that I bought 4 of these things so I swapped it out for the second one. After painting just a short time it came apart. So we switched it out for a standard roller. It did leave a little texture but it did not fall apart so I was happy. The first coat of paint went down easily and turned out pretty good. I went to Lowe's this evening and picked up 4 Wooster smooth rollers. Along with that we also picked up Great Stuff Door & Window foam, another gallon of gloss white (We are running low), an additional gallon of paint for the lower body, another pack of rags, another razor scraper, some of the small (High Quality) foam rollers & Silicon (For resealing the vents when the paint is done). The total came to around $125.00. 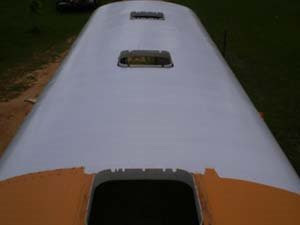 Now the roof has one coat of paint and if the weather permits, tomorrow it will have it's final coat!